Biggest environmental action day ever October 24. On October 24 there were 5,242 simultaneous events on climate in 181 countries. This make this day the biggest international environmental action day ever. International environmental action days started in 1970 when a “Traffic revolution” against car traffic was organized in 12 countries, people occupied the streets by going slowly across pedestrian crossings or simply standing on their hands in front of police cars surrounded by confused policemen. The same year Earth Day put forward a less confrontational message and made success in the US. Since than international environmental action days have been used to mobilise in very different ways. In response to the growing concern for the environment the UN Conference of the Human environment was inaugurated on June 5 in 1972, since than celebrated as World Environment day. After the Chernobyl accident April 26 became another action day as August 6 have been to commemorate Hiroshima. Late 1980s also May 15 became an action day against building of motorways organised by European Youth Forest Action. This tradition was built upon by the first International Climate Action Days 1991-92 which took place in 70 countries on more than 500 places. This tradition was renewed in 2005 reaching in 2007 the same level as in the early 1990s. Last year there was a smaller drop in participation. This makes the International Climate Action Day October 24 this year a great success with raising the number of countries involved to 2 1/2 times as much as earlier and the number of places to ten times more than in the early 1990s. The 350.org’s International Day of Climate Action is a key moment in the Tck Tck Tck campaign on the road to the next UN climate change meeting in Copenhagen this December. 350.org uses novel approaches to political organizing, combining the web and SMS networks, distributing lightweight Flip video cameras, and training young people on multiple continents. The outcome must be described as successful. The creativity used all across the globe to present the message of the campaign have shown that many wants to participate in new ways that was first used very broadly at the Anti Iraq war demonstrations in 2003. The large number of activities shows the effectiveness of American campaigning. It contributes to the awareness of climate change in a good way and shows that the criticism against Anglo-American political culture that is promoted by the author of this blog is not always relevant. Yes the political message is unclear. The focus is all on science and the role of people in common is to support the scientific argument in order to “help our leaders realize we need a real solution that pays attention to the science.” Furthermore the action wants to “put pressure on the huge UN Climate meeting in Copenhagen.” and with “a clear and specific goal (unlike vague demands to “stop global warming”) that helps move the negotiations in the direction science and justice demand.” Here in the margins the concept of justice is used once. Still the action reaches out broadly without necessarily proclaim one or another specific solution although a tendency is to see politicians as powerful and people as less important actors whose actions mainly is to support the demands from scientists and then tell politicians to see them as important. In spite of these limitation the campaign also mobilizes people that maybe never would have become active without that it was organised in this way. This may even change the political climate not only for politicians but also for the climate justice movement. One way that the climate justice movement used the October 24 international action day was to expose carbon trading scam. Led by Rising Tide North America, Carbon Trade Watch, the Camp for Climate Action and the Mobilization for Climate Justice, activists from around the world helped compile hundreds of reasons exposing the fallacies and failures of carbon-derivatives markets and offsetting programs – such as the displacement of food crops, the burning of valuable resources and massive subsidies given to oil, coal and other major climate polluters. Both at a meeting called Inspiration Latin America in Stockholm an at a consultation organised by People’s Movement on Climate Change in Copenhagen it became evident that migrants will play a crucial role in the Copenhagen process. Latin American migrant communities in Sweden play an important role in mobilising for international issues in Sweden. This became evident in the organizing of European Social Forum with some 15 000 participants last September in Malmö only 30 minutes away from Bella center. Here Bolivian, Chilean, Brazilian, Peruvian and other migrant communities vitalized the forum by putting equal effort into culture, politics and food. 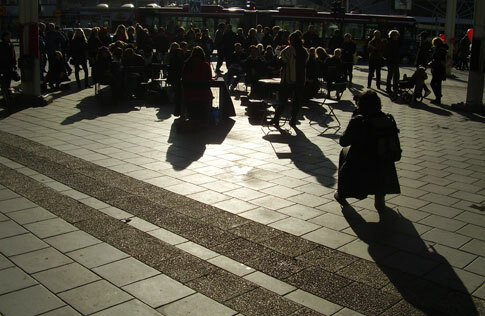 So was also the case at the Latin America Inspiration meeting were many hundreds of people gathered in the working class suburb Rinkeby in Stockholm. As part of the meeting a tribunal against the Finnish-Swedish forest corporation Stora Enso that is in conflict with Via Campesina on land grabbing and monoculture issues was arranged by the Latin American groups, the support group for MST and Friends of the Earth Sweden. Criminalization of popular movements was another important subject at the meeting. There were also a meeting to prepare for the Climate summit in Copenhagen were both practical issues on organising transport jointly to political content wass discussed. 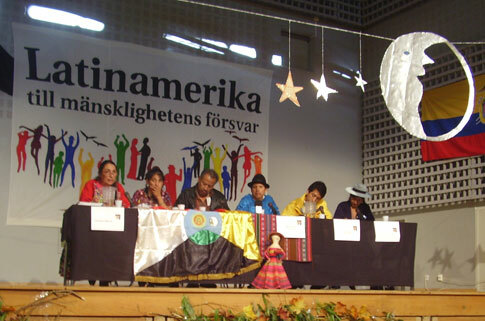 Latin American groups in Sweden is one of the bigger solidarity organisations in Sweden issuing the only magazine on Latin America in the Nordic countries. 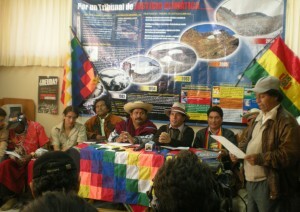 The chairman and vice chair are from Chile and Quecha Indians Communities in Peru. Together with friends of the Earth a joint petition campaign on the net has been started to influence the Swedish positions before COP15. In Copenhagen the Philippino migant community played an important role at the PMCC consultation on climat justice. Here it became clear that migrant communities can play a crucial role in understanding the climate justice issue. The discussion became very substantial going from COP15 negotiations to the issue of how buildings should be one store or two stores high, roads made of gravel to avoid problems when floods become more common and replanting mangrove trees in the Philippines and then going back to the possibilities of mobilising migrant communities for the climate justice bloc on the December 12 demonstration. Migrants bring the climate justice issues down to earth. 1. Building a movement of movements takes great steps forward. 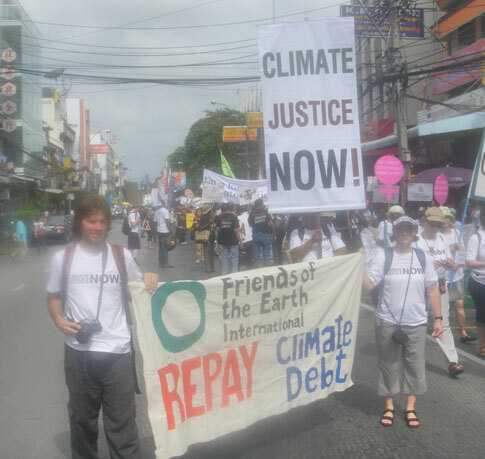 Both Climate Justice Action and Climate Forum 09 gets much stronger support from global popular movements and organisers of the two initiatives show more openness in listening to criticism. 2. Via Campesina moves forward in the process linking more closely to Climate Forum and strengthening action-orientation. 3. 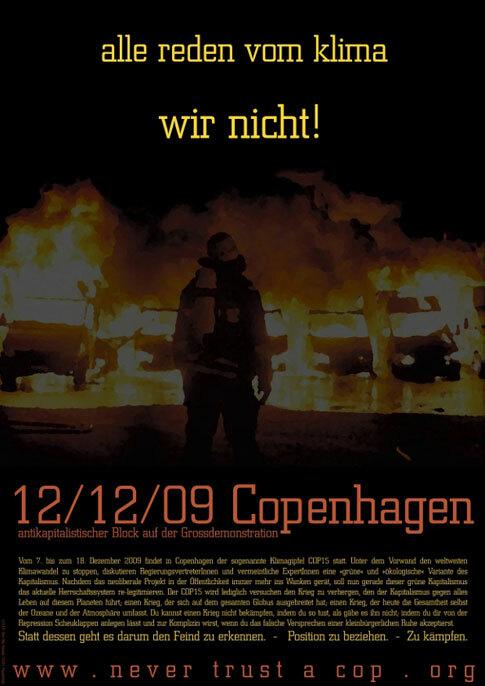 Anti-imperialistic forces strengthen their role in Copenhagen in both CJA, Climate Forum process and by initiating the probably biggest mass meeting during COP15 on December 17. 4. Big NGOs criticised and change position. 6. 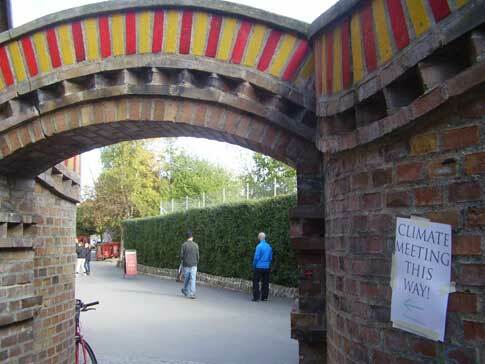 Changing main stream leftist and environmental messaging in Sweden towards COP15. The last climate justice week have seen some drastic changes towards strengthening a climate alliance before, during and after Copenhagen. While the US and EU more and more tries to avoid the responsibility of rich nations to make substantial contributions to stop global warming an alliance of popular movements and impoverished nations take great leaps forward. This can be seen in Bangkok among both those inside the negotiations and outside, both among governments and the so called civil society and its non-government organisations. When the US and EU goes drastically in the direction of even attempting at destroying the Kyoto agreement replacing it with a useless process with no specific demands governments in Africa, Latin America, Asia and the Pacific increasingly oppose the political pressure from the rich countries. Now not only activists talks about “Seattle the Copenhagen process” but also some governmental voices. What we can hope for according to Tadzio Müller, a German activists in the Climate Justice Action, as a historical new alliance emerging between the old environmental movement, the globalisation critical movement and many mass movements from the south building a movement of movements for the struggle for climate justice. Climate Justice Now! Network followed suit after People’s Movement on Climate Change and decided to co-arrange the CJA reclaim Power action on December 16 with some decisive changes. No more mass penetration of the official venue but pushing forward to the fences and there create a space for climate justice demands together with government and NGO delegations from the inside. Almost no Danish organisations is yet behind the initiative while now global popular movements intervene in the Danish passivity and forces Danish organisations to choose between being bystanders or participate and influence the mass action. The CJA meeting to discuss further takes place in Copenhagen October 15-17. Friends of the Earth International and Via Campesina also followed suit after PMCC and became more seriously involved in the Climate Forum 09 process. At a meeting with Joseph Zacune from FOEI and Nico Verhagen from Via Campesina a common understanding was established and an outline of a closer relationship between global popular movements and Climate Forum 09 discussed including active participation ion the declaration process. The Danish initiators made it clear that they adjust to the criticism for aiming at a to long declaration but stick to their intention to include a piece on the goal of sustainable transition of our societies and how it can be done while also including the climate justice demands. A meeting has been announced for October 18 in conjunction to the CJA meeting to discuss the international cooperation and declaration process further. 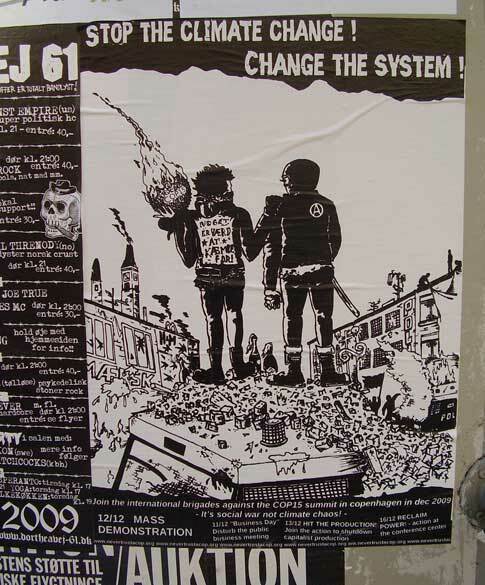 Via Campesinas active involvement have lessoned tensions in Copenhagen. With important and good experience from Summits as in Cancun 2003 with solidarity between many different protesters and bad experiences from Hongkong 2004 VC plays a crucial role in understanding the need for combining mass actions on the streets with political struggle inside negotiations and links to progressive governments. VC os active in the Trade to Climate caravan from the WTRO summit in Geneva to Copenhagen and in organizing agricultural actions on December 15. While other international organisations were more reluctant peoples Movement on Climate Change was very active both in the CJA process and the Climate forum declaration process as well as in Bangkok. This have put this anti-imperialistic initiative in an advantage position that is now changing somewhat as new international organisations becomes involved. 18 Danish organisations now also announces that they will arrange the probaly biggest mass meeting during COP on december 17 with the presidents of the ALBA countries from Latin America at the Valby hall with space for 5000 participants. Southern nations have been radicalised during the Bangkok meeting and now starts to question the position of some Northern NGOs. Meanwhile it is reported that for the first time CAN, Climate Action Network is critical towards emission trading. The whole political field is moving towards more polarisation and the big NGOs have to adjust. Also from the December 12 initiatives comes more radical messages about what the demonstration is about. 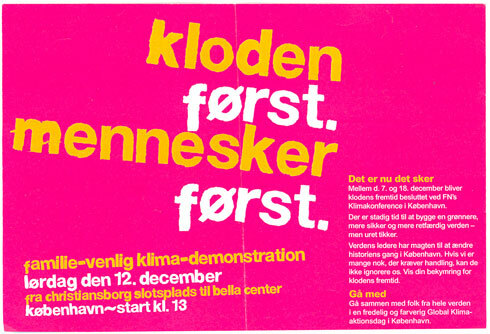 FoE Sweden climate actvists have made a memorandum on the december 16 CJA action. At a meeting on October 8 in Malmö it became clear that many of the priciples have been met by changes in the plans and due to influence from CJN! But quite a few questions remains to be addressed. What strategies should the climate movement which is becoming a climate justice movement have before, during and after the Copenhagen summit? 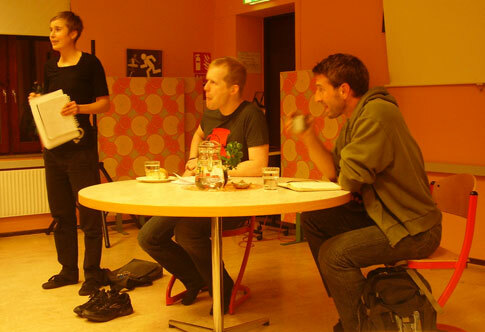 These were issues that were debated at a cafe meeting arranged by the Friends of the Earth and Attac Malmö at the Kvarnby People’s High School October 8 some 45 minutes by public transport from the COP15 venue. Tadzio Mueller from the Climate Justice Action and Reclaim Power action December 16 were invited to speak together with Andreas Malm from the December 12 Initiative, which organizes a demonstration in Copenhagen. The meeting was well attended by some 70 people, mainly young activists from Malmö. The meeting was opened by a confrontation. Andreas Malm attacked the ideas to penetrate in mass scale the Bella Center on December 16, where the climate negotiations with the heads of states takes place. Malm also sharply attacked the shortcomings of the Kyoto protocol and the way that rich countries are opposed to the poorer countries’ demands in the process. The political power struggle in Copenhagen he described as periphery struggling for survival against the Center. He argued further that a bad treaty in Copenhagen is worse than no treaty at all. Such a bad agreement is now what the United States and Europe promotes. It would contribute to false solutions to climate change and also be worse than the original Kyoto protocol. He also stated that denouncing the UN or the COP process as such was a big mistake. It is necessary to acknowledge the difference between the UN as the only body in which all countries can have their voice heard and bodies like the WTO or G8, where the rich countries sets the agenda. An example of this anti-UN and COP position he took was the Network Never Trust a COP who oppose the government’s legitimacy and the whole climate summit. Instead of this attitude and an action aiming at occupying the conference for a whole day Malm suggested that more important was broad mobilizations such as the December 12 Initiative. This initiative brought together a wide range behind the radical demand that the Western countries that emitted most greenhouse gases in the atmosphere are most responsible for act and promote solutions. Market solutions as a model for climate policy was rejected according to Malm by the December 12 initiative. Instead the platform promotes that rich countries invests in renewable energy and adaptation to climate change in poorer countries. Tadzio Mueller pointed to the need for mass action that highlights the existing conflicts. He said that even broad mass demonstrations and can have demobilising effects and not establish any lasting movement. He took the anti Iraq war demonstrations as an example. In contrast he put Seattle in 1999 that led to the movements that had previously been separated formed a globalization-critical movement. Many were inspired by the mass actions in Seattle, and particularly the civil disobedience actions that tens of thousands took part in while the violent clashes with the police were very few. In addition, Tadzio could announce that Climate Justice Now, which consists of mass movements in particular from the South decided to support and co-organize the mass action at Bella Center December 16 in a modified form. Massive penetration is no longer the issue but to press forward to the fences around the Bella Center and create a space for climate justice together with delegations from the inside. There has been in Sweden a strong concern among many organizations against the decision taken by the Climate Justice Action in June promoting a mass-scale penetration COP15 meeting at the Bella Center on December 16. The worries have existed in both Klimax, autonomous groups, Friends of the Earth, Climate Action and other leftist and environmental groups. The basis of the concern has been to different reasons. One common Swedish concern among a wide range of political forces is well-targeted actions based on good information about what is politically and practically feasible and a good trust in each other where there is confidence in the commitment to common principles. Organizations may have different tactics and strategy in general also in Copenhagen. But there is in Sweden a strong desire to cooperate across differences in actions that shows the seriousness of the climate justice demands and how they are in conflict with the prevailing policies of rich countries in the COP process and influence in world politics more generally. A penetration action in mass scale at the Bella Center could well lead to an escalation of violence that makes political damage and can cause very serious injuries. No organization in Sweden have supported this idea as we know of, on the contrary, there has been strong disapproval. Friends of the Earth has been actively intervening in order to change the way the action was planned and influence both the Danish organizations, Climate Justice Action and international social movement. Instead of penetrating in mass scale FoE Sweden climate group proposed a mass action towards the Bella Center, were only a group a group representing the mass action mainly with representatives from the South are demanded to come into the summit to present their case. If this is not possible to arrange a meeting at the barriers between the delegations of governments and NGOs on the inside supporting climate justice demands and the mass action on the outside can in practice move the COP15 and get a focus on the alliance between social movements and governments that may be the lasting power of Copenhagen to continue struggling for Climate justice demands. “We demand that world leaders take the urgent and resolute action that is needed to prevent the catastrophic destabilisation of global climate, so that the entire world can move as rapidly as possible to a stronger emissions reductions treaty which is both equitable and effective in minimising dangerous climate change. We demand that the long-industrialised countries that have emitted most greenhouse gases currently in the atmosphere take responsibility for climate change mitigation by immediately reducing their own emissions as well as investing in a clean energy revolution in the developing world. Developed countries must take their fair share of the responsibility to pay for the adaptive measures that have to be taken, especially by low-emitting countries with limited economic resources. If this is a clear message enough message can be discussed. A clear climate justice message can and should also be directed against big NGOs now criticized by the governments of the South not to pursue climate justice demands during the climate negotiations. It can be seen as the contrary as if the platform gives free rein to the message from big NGOs for charity in support of poor victims of climate change instead of struggling for climate justic against market based solutions together with the global majority rather than Malm’s interpretation. This report raised some discussion. It is true that the goal is not any more to organise a mass penetration of the Bella Center. Instead it is to overcome police barriers and enter the Bella center area, which is slightly differtn from what is stated above, to press forward to the fences around the Bella Center. The point of views in this report does not necessarily are the same as that of Friends of the Earth Sweden. This has been discussed among members in the climate group of the Friends of the Earth Sweden. It has not yet been discussed and decided in the board. As Climate Justice Now! and Climate Justice Action have meetings tommorrow and day after tomorrow in Bangkok we saw the need to send this now to relevant email lists. 2. The goal is to create a outside-inside action with the collective help of both people on the outside and inside which puts forward demands for social and global justice to the climate crisis. 3. UN in Denmark and also to many mass movements from the South has legitimacy. 4. The demand that COP15 becomes a temporary platform for collective voices from the outside and especially from the South is legitimite. 5. The pressure rich countries put on poor countries in the negotiations makes it necessary to use mass actions to support voices free from this external pressure from rich countries. 8. A key to success is representatives from mass movements in the South as well as some few governmental delagations and radical NGOs inside the negotiations that support climate justice demands. These principles and the political goal is not possible to achieve with the way the decision at the CJA meeting in June has been presented. Firstly it is not practically possible for a mass action to completly take over the COP15 for one day. This both due to the legitimate response from the police on such a goal and the physical situation of the Bella Center which makes it impossible to come into the building the way that has been proposed. It has already been tested unsuccessfully at an EU Summit in December 2002. Furthermore many organisations supporting the climate justice demands of such an action sees the proposed form of the action as contraproductive and only resulting in violence. The necessary mass participation both from the outside but also from the inside will not be possible to achieve. To become unpredictable for those opposing climate justice demands it is necessary to build on the unique possibilities to make a combined outside-inside action. An action were the main collective strength comes from the mass participation on the outside and the unpredictability from how well the legitimate concerns from outside voices especially from the South can get support from people in common and voices inside. The political price for the organisers of the conference has to be so high that they have to allow at least a core group with a majority of voices from the South of the mass manifestation to use COP15 as a platform for its message. The alternative if the possbilites to get inside will be exhausted and politically impossible in spite of pressure and on the spot negotiations is a mass meeting at the cordon at the Bella Center with people from the inside and outside making this in practice the temporary platform of the COP15. To create a platform inside was possible at the UN Summit on sustainable development in Bergen 1990 for industrial countries. 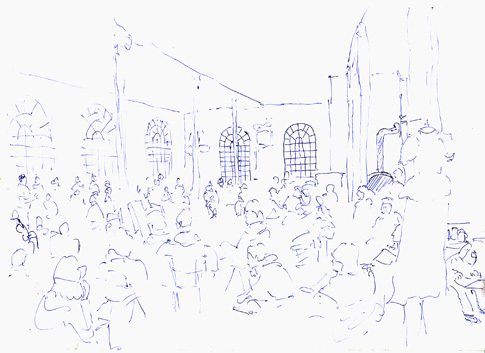 Here the conference venue was surrounded by demonstrators who did not allow the participants to go to a dinner. Finally persons from the movement against Union Carbide from Bhopal in India and one from an industrial country were invited to bring forward the message of the action at the conference. In Copenhagen the number of demonstrators and official delegates will be many more and the tensions between rich countries and some countries from the South more intense opening up more opportunities as well as need for well-informed choices. With an action that focus upon political goals and the dynamics that a mass action and inside-outside alliances can build it is possible to create a situation with the message that the solution to the climate crisis is only possible through social and global justice. To become predictable to participants, which among others movements from the South have requested, it is of importance with some measures. It is of importance to acknowledge that Danish authorities and political parties is escalating a repressive political climate against protesters. Thus the fine for confronting the police have been raised ten-fold, a new law making it possible to arrest people and temporarily move them have been implemented and the media is doing its best to present committed activists as violent. The police in general is known to be brutal and unpredictable at many occasions and the public known to not react much on such police brutality against protesters. Firstly the kind of strict non-violence including not responding to escalation from the side of the police which was part of the decision at the CJA meeting in June is good. These principles have in practice been successfully used at the Shut it down action against a coal plant in Copenhagen when police but not demonstrators used some violence. This action was helped by the homogenous composition of the participants which will not be the case in December. The strict non-violence code of conduct is crucial in getting wide support for the action and limit the possibilities of the police to be brutal when the future of the world is negotiated at COP15 and voices from the outside have legitimate concerns to be heard. It is necessary to demand a dialogue with the police to strengthen the political position of the action thus making participation more predictable. One cannot necessarily trust the police to follow what they say but the price for repressions against an action will be higher by demanding dialogue. If the police refuse and maintain an antidialogue policy which has been common in Denmark sometimes it is necessary to demand from political parties that this is maintained. It should be clear who is responsible for not wanting a dialogue. It is also useful to ask for permission to march to the Bella Center. But the question of allowance for the action is less important. The action have a legitimate concern and authorities should not be allowed to define if it can take place at the Bella Center or not. Allowance should be applied for and if not given demands should be put forward for a dialogue with the police. Ways to further deescalate the polarisation and attempts at creating a split in the climate justice opinion can be counteracted also by other means. What creates the strength of the action is outside-inside action at the Bella Center and mass participation focusing on the legitimacy of the global majority. Thus supporting the Southern representatives in the action and rather dress up as Southern populations than in young militant European outfit could be a way to promote the goal of the action. Involving different groups in Copenhagen and international guests in making our demands and broad representation visible is importance to challenge the enemy image which our opponents tries to promote. There could be different solutions to get a broad involvement in the action. It is necessary to understand the need for take into consideration that the UN in Denmark is legitimate and to question the UN or the Summit as such will not get support. This is also the case for mass movements from the South. They make a clear distinction regarding WTO, G8 or other institutions which they often regard as illegitimate while the UN in spite of it short comings is seen as legitimate as an institution. Detta har diskuterats av medlemmar i klimatgruppen inom Miljöförbundet Jordens Vänner. Det har ännu inte diskuterats och beslutats av styrelsen. Det har rests frågor kring formerna för massaktionen vid Bella Center den 16:e december som har utlysts av Climate Justice Action. 1. Det skall finnas ett politiskt mål med aktionen som är genomförbart. 2. Målet är att skapa en samordnad aktion som överbryggar klyftan mellan insida och utsida av konferensen med hjälp av personer både inifrån och utifrån som presenterar krav på global social rättvisa i relation till klimatkrisen. 3. FN har legitimitet i Danmark och hos massrörelser från syd. 4. Kravet att COP15 blir en tillfällig plattform för kollektiva röster från utsidan och speciellt från syd är legitimt. 5. Trycket som de rika länderna utövar mot de fattiga länderna i förhandlingarna gör det nödvändigt att använda sig av massaktioner för att stödja röster som är fria från detta externa tryck. 6. Det är nödvändigt att aktionen blir förutsägbar för deltagarna. 7. Det är fördelaktigt om aktionen blir oförutsägbar för de som motsätter sig rättvisa klimatkrav. 8. En nyckel till framgång är representanter från massrörelser i syd samt vissa officiella delegationer och radikala icke-statliga organisationer inom förhandlingarna som stödjer rättvisa klimatkrav. 9. En annan nyckel är massdeltagande i aktionen. Dessa principer och det politiska målet är inte möjliga att nå enligt den metod som presenterades på Climate Justice Actions möte i Juni. För det första är det inte praktiskt möjligt för en massaktion för att helt ta över COP15 under en dag. Detta både på grund av polisens legitima reaktion på ett sådant mål och den fysiska situationen runt Bella Center, som gör det omöjligt att komma in i byggnaden på det sätt som har föreslagits. Detta har redan provats utan framgång under EU-mötet i december 2002. Vidare så ser många organisationer som stödjer rättvisa klimatkrav en sådan form av aktion som kontraproduktiv och endast ledande till våldsamheter. Det nödvändiga massdeltagandet från både in- och utsida kommer inte vara möjligt att uppnå. För att bli oförutsägbar för motståndarna till rättvisa klimatkrav är det nödvändigt att bygga kring den unika möjligheten att genomföra en kombinerad inside-utside-aktion. En aktion där den huvudsakliga kollektiva styrkan kommer från massdeltagande på utsidan och oförutsägbarheten i hur väl legitima röster från utsidan, särskilt från syd, kan få stöd från allmänheten och röster inne på konferensen. Det politiska priset för konferensens organisatörer måste vara så högt att de måste låta åtminstone en kärngrupp från massaktionen, med en majoritet från syd, att använda COP15 som en plattform för sitt budskap. Alternativet om möjligheterna att ta sig in är uttömda och politiskt omöjliga trots påtryckningar och förhandlingar på platsen är ett massmöte vid avspärrningen utanför Bella Center med personer från inifrån och utifrån konferensen, för att på det sättet skapa en tillfällig plattform som i praktiken blir ett fokus i COP15 processen. massaktionen och grupper på insidan är det möjligt att skapa en situation som för fram budskapet att lösningen på klimatkrisen är endast möjlig genom social och global rättvisa. För att bli förutsägbar för deltagarna, vilket bland annat rörelser från syd har efterfrågat, är vissa förutsättningar nödvändiga. Det är viktigt att understryka att danska myndigheter och politiska partier trappar upp ett repressivt politiskt klimat mot aktivister. Därför har bötessumman för konfrontation med polisen tiodubblats, en ny lag har som gjort det möjligt att frihetsberöva personer har antagits och media gör sitt bästa för att utmåla övertygade aktivister som våldsamma. Polisen i allmänhet är känd för att ha varit brutal och oförutsägbar vid många tillfällen och allmänheten är känd för att inte reagera på polisbrutalitet mot demonstranter. För det första är den typ av strikt icke-våldsprincip som inkluderar att inte svara på upptrappning från polisens sida som var en del av beslutet på CJA-mötet i juni bra. Dessa principer har i praktiken varit framgångsrika vid Shut it down-aktionen mot ett kolkraftverk i Köpenhamn, där polisen men inga demonstranter kom att använda våld. Denna aktion hade en fördel av att vara mycket homogen, men så kommer inte vara fallet i december. Den strikta icke-våldsprincipen är helt nödvändig för att skapa brett stöd för aktionen och minska riskerna för polisbrutalitet när världens framtid förhandlas om vid COP15 och röster från utsidan har legitima krav som måste bli hörda. Det är nödvändigt att kräva en dialog med polisen för att stärka aktionens politiska position och genom detta göra aktionen mer förutsägbar. Man kan inte nödvändigtvis lita på att polisen gör som de har sagt, men priset för repression mot en aktion blir högre genom att kräva dialog. Om polisen vägrar och insisterar på en anti-dialogpolicy, vilket varit vanligt i Danmark är det nödvändigt att kräva en sådan av de politiska partierna. Det bör vara tydligt vem som har ansvar för att inte vilja ha någon dialog. Det är också användbart att begära tillstånd att gå till Bella Center. Men frågan om tillståndet att gå till Bella Center är mindre viktigt. Aktionen har en legitim orsak och myndigheter skall inte tillåtas att bestämma om den kan äga rum kring Bella Center eller inte. Man bör ansöka om tillstånd, men om detta inte ges bör man ställa krav på dialog med polisen. Minska interna konflikter genom att synliggöra dynamiken mellan inne och ute. Metoder att vidare minska polariseringen och försöken att splittra opinionen för rättvisa klimatkrav kan också motverkas med andra medel. Det som skapar styrka i aktionen är dynamiken mellan inne och ute vid Bella Center och massdeltagande som fokuserar på det legitima hos den globala majoriteten. Att stödja representanterna från syd genom att snarare klä sig som ursprungsbefolkning från syd snarare än som ung europeisk militant kan vara en metod att stödja aktionens mål. Att involvera olika grupper i Köpenhamn och internationella gäster i att framföra aktionens krav samt att skapa synlig och bred representation är vikigt för att utmana hotbilden som våra motståndare försöker lyfta fram. Det är nödvändigt att ta i beaktande att FN i Danmark ses som legitimt så att ifrågasätta FN som helhet eller själva konferensen i sig kommer inte att få stöd. Detta gäller också massrörelser från syd. De gör en tydlig distinktion mellan WTO, G8 och andra institutioner som de ser som illegitima men FN själv ses som legitimt trots dess tillkortakommanden.